PT Kereta Commuter Indonesia - PT KCI (previously registered as PT KAI Commuter Jabodetabek) is a reputable mass transportation services company in Indonesia. 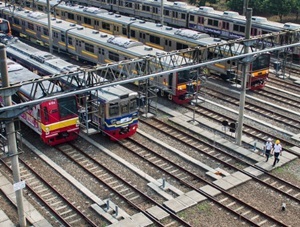 Based in Jakarta, PT KCI has principal business activities in commuter railways. PT KCI operates primarily as a commuter railways provider that provides commuter railways transportation services in the area of Jakarta Metropolitan and its surrounding; Jakarta, Bogor, Depok, Tangerang and Bekasi, Banten and Cikarang. PT Kereta Commuter Indonesia is a directly-owned subsidiary company of PT Kereta Api Indonesia (Persero) or KAI Group, the largest state-owned railways company in Indonesia. At present, PT Kereta Api Indonesia (Persero) holds 99.78% shares in PT KCI. Other 0.22% remaining shares in PT KCI was owned by Pusaka Foundation. PT KCI runs its business through 826 units of Light Rail (KRL) which serving 72 stations throughout JABODETABEK with a range of service reaches 184.5 km (as of October 2016). In the business year of 2016, PT KCI was able to achieve a better performance compared to 2015. According to PT Kereta Api Indonesia (Persero) Annual Report 2016 as cited by JobsCDC.com, PT Kereta Commuter Indonesia managed to record revenue of Rp2,044.95 billion in 2016, an increase of 18.2% from the previous year of Rp 1,729.75 billion. Referring to its annual report, PT KCI booked a net profit of Rp288.39 billion, increasing 13.5% from net profit in 2015 of Rp254.12 billion. Minimum Bachelor Degree (S1) from a leading university with minimum accreditation "A", majoring in Visual Communication Design (preferred), Multimedia Technology, Multimedia Design. JobsCDC.com now available on android device. Download now on Google Play here. Please be aware of recruitment fraud. The entire stage of this selection process is free of charge. 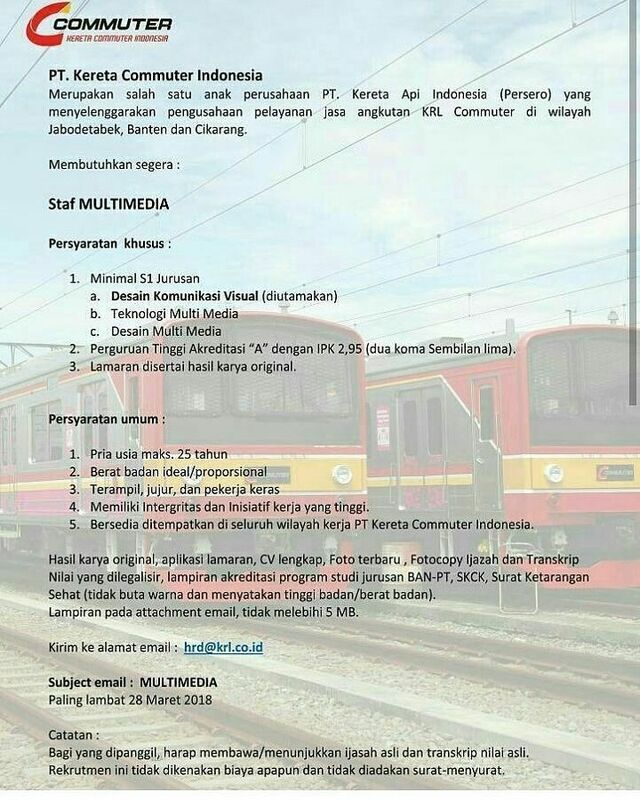 PT Kereta Commuter Indonesia - Multimedia Staff KCI KAI Group February 2018 will never ask for fees or upfront payments for any purposes during the recruitment process such as transportation and accommodation.